Acinetobacter baumannii is a nosocomial pathogen which is reported as a major cause of morbidity and mortality in intensive care units (ICUs). However, there is a lack of analysis focused on multidrug-resistant Acinetobacter baumannii (MDRAB) infection among patients from pediatric intensive care unit (PICU) in China. The aim of this study was to investigate the molecular characterization of MDRAB isolated from PICU. In this study, 86 isolates of MDRAB were collected from PICU patients, from the First Affiliated Hospital of Sun Yat-sen University. The minimal inhibitory concentrations (MICs) of the isolates against common antibiotics were determined. The carbapenemase-encoding resistance genes and AdeABC-AdeRS efflux system genes of these isolates were detected by PCR. Real-time PCR was performed to determine the relative expression of the relevant efflux pumps. Among 86 strains of MDRAB, 76.7% (66/86) were carbapenem-resistant A. baumannii (CRAB). All 86 clinical isolates possessed the blaOXA-51 gene. BlaOXA-23 was detected as the second most frequent (90.7%) carbapenemase. Harboring AdeABC efflux pump genes was prevalent among the majority of the MDR isolates. Specially, the distributions of AdeABC-AdeRS efflux system genes in CRAB strains reached up to 90.0%. Compared with those of the CSAB strains, there was a statistically significant increasing distribution of the regulator AdeR and AdeS genes(p < 0.05). Moreover, CRAB strains showed significantly increased expression of AdeB(12.3- fold), but decreased expression of AdeR (3.3- fold)(p < 0.05). The present study showed a high distribution of multiple genes, mainly the genes of blaOXA-23/blaOXA-51 carbapenemase and AdeABC efflux pump, is responsible to distinct drug-resistance in PICU. It is urgent to strengthen the molecular epidemiological surveillance of pediatric MDRAB isolates to prevent further outbreaks. This study is of significant help for the clinicians to make therapeutic decisions and manage infection control in PICU. Acinetobacter baumannii has been reported as an epidemiologically and clinically life-threatening nosocomial pathogen causing critical morbidity and mortality, especially in intensive care units (ICUs) . The drug resistance rate against carbapenems of this organism is alarmingly high. It is extensively reported that carbapenem resistant strains of Acinetobacter baumannii (CRAB) have caused the hospital outbreaks worldwide [2–4]. Although, A. baumannii was frequently and classically reported as a main hospital-acquired pathogen in adults, it is also a critical pathogen in the pediatric intensive care unit (PICU), because of invasive surgery, severe basic diseases, immunodeficiency, and prolonged hospitalization among the pediatric patients [5, 6]. Several outbreaks of carbapenem-resistant A. baumannii in the PICU have been documented in the last decade [7–9]. To increase awareness and improvement of epidemiological surveillance is a significant and critical factor of successful infection control and is particularly recommended in ICUs. To our knowledge, few studies on the molecular characterization of MDRAB isolated from PICU are reported in China. Thus, the present study was conducted to determine the molecular characteristics among the MDRAB strains from PICU in a tertiary hospital in Guangzhou, China, during a 5-year period from January 2013. Eighty-six non-repetitive multidrug-resistant Acinetobacter baumannii strains were obtained from different PICU patients, in the First Affiliated Hospital of Sun Yat-sen University, Guangzhou, China, from January 2013 to December 2017. The isolates were collected from cultures of respiratory tract specimens (80 isolates, including 74 isolates from sputum samples and 6 isolates from nasal secretion samples), blood (5 isolates), and stool (1isolate). These strains were identified by an automated microbiology analyzer (bioMérieux, Marcy l’Etoile, France) according to the manufacturer’s instructions, and confirmed on blaOXA-51 polymerase chain reaction (PCR). This report was approved by the Clinical Research and Ethics Committee of the First Affiliated Hospital of Sun Yat-sen University. Antimicrobial susceptibilities for isolates were determined initially using Gram-negative susceptibility (GNS) cards on the Vitek system (bioMérieux, Marcy l’Etoile, France) to designate isolates as either carbapenem-resistant A. baumannii (CRAB)(with imipenem MICs≥8 μg/ml) or carbapenem -susceptible A. baumannii (CSAB) (with imipenem MICs≤2 μg/ml). Susceptibility interpretations were based on CLSI clinical breakpoints (2017; CLSI Document M100-S27). The tested agents included ampicillin/sulbactam, piperacillin/tazobactam, cefotaxime, ceftazidime, cefepime, imipenem, amikacin, gentamicin, ciprofloxacin, levofloxacin, trimethoprim/sulfamethoxazole, and tigecycline. Quality control for the MIC analysis was performed with E. coli ATCC 25922 and P. aeruginosa ATCC 27853. Bacterial DNA was extracted from A. baumannii isolates by boiling. PCR was performed using TaKaRa Ex Taq (Takara Bio Inc., Otsu, Japan). All PCR primers targeting resistance genes and mobile elements used in this study are listed in Table 1. PCR was performed in a 25 μL reaction mixture containing 1 μL primer, 1 μL Taq polymerase, 3 μL DNA template, 3.0 mM MgCl2, 2.5 μL 10 × buffer, 0.2 mM dNTPs, and nuclease-free water. Amplification conditions consisted of denaturation at 94 °C for 5 min and 30 cycles of denaturation at 94 °C for 1 min, annealing at 56 °C for 30 s and extension at 72 °C for 1 min, with a final extension at 72 °C for 10 min. PCR products were detected in 2% agarose gel. The expression of efflux pumps of AdeABC-AdeRS was quantified. The total RNA of isolates was extracted with TRIzol extraction (Invitrogen, Carlsbad, CA, USA) according to the manufacturer’s instructions. The relative expression of the efflux pumps was determined using real-time PCR by SYBR® Premix Ex TaqTM (Takara Bio Inc., Otsu, Japan) on the Applied Biosystems® 7500 Fast Dx Real-Time PCR Instrument (Life Technologies Corporation, Foster City, CA). The RT-PCR reaction mixture was prepared in a volume of 20 μL comprised of 3 μL of cDNA, 10 μL 2 × SYBR® Premix Ex Taq II (Tli RNaseH Plus), 0.4 μL 50 × ROX Reference Dye or Dye II and 0.8 μL of each primer. The PCR reaction was carried out under the following conditions: 1 cycle of 30 s at 95 °C, 40 cycles of denaturation at 95 °C for 30 s, annealing at 53 °C for 30 s, and elongation at 72 °C for 30 s, with one final cycle of 5 min at 72 °C. Reactions were repeated in triplicate and the fold changes in expression of these genes were calculated relative to the level of housekeeping gene 16S rDNA using the comparative CT method (2–ΔΔCT method). Data are described using the mean and standard deviation (mean ± s). Categorical variables were compared using Fisher’s exact test. A p value of 0.05 was considered statistically significant. Statistical Package for the Social Sciences (SPSS) for Windows Version 16.0 (SPSS Inc.; Chicago, IL, USA) was used in this study (Fig. 1 showed a flow chart for representing this research methods). The findings of the antibiotic susceptibility testing for all isolates were showed in Table 2. Among the 86 MDRAB strains, 76.7% (66/86) were CRAB, which showed 100% resistant to many of the tested antimicrobial agents, except tigecycline. The distribution of carbapenemase and efflux pump genes in drug-resistant strains was shown in Table 3. Of note, blaOXA-51 genes were present in all 86 MDR A. baumannii isolates. BlaOXA-23 was detected the second most frequently (90.7%) of carbapenemase. The ISAba-OXA-51, blaOXA-24, blaOXA-58, and NDM-1 genes were detected in 23.3% (20/86), 22.1%(19/86), 3.49% (3/86), and 3.49% (3/86) of the 86 MDR isolates, respectively. Among the CRAB strains, there was a statistically significant increasing distribution of blaOXA-24, blaOXA-58, and ISAba-OXA-51(p < 0.05). The majority of the MDR isolates were found to harbor AdeABC efflux pump genes. 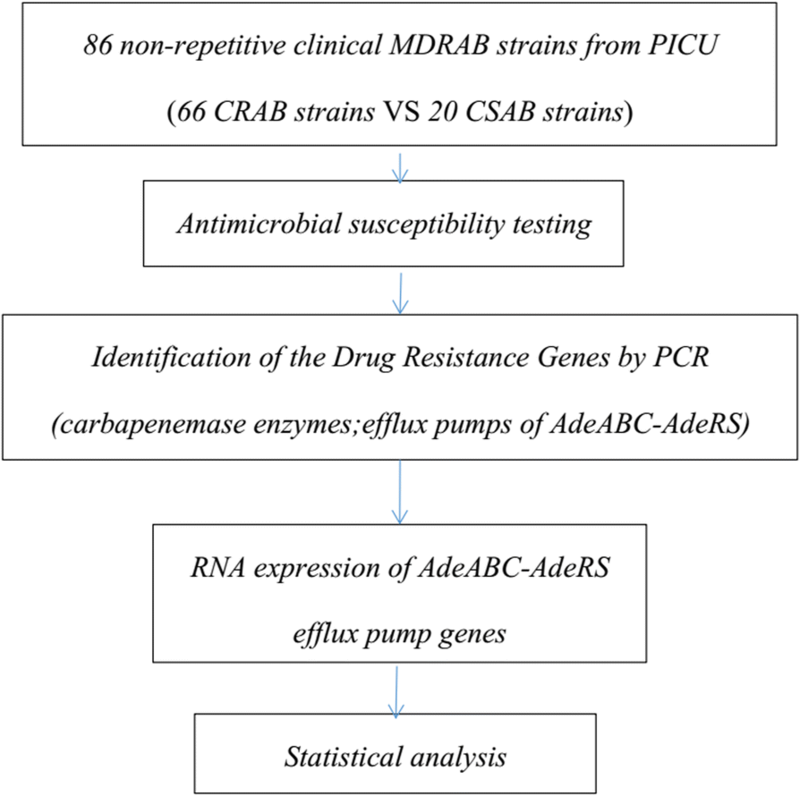 Notably, the distributions of AdeABC-AdeRS efflux system genes among CRAB strains were more than 90.0%, and compared with the CSAB strains, there was a statistically significant increasing distribution of the regulator AdeR and AdeS genes(p < 0.05). Specifically, there was a higher distribution of co-harboring AdeABC-AdeRS efflux system genes and blaOXA-23 among the CRAB strains (Table 4). The level of expression of the AdeABC-AdeRS efflux system genes was measured by qRT-PCR (Table 5). It was found that, compared with those of CSAB strains, CRAB strains showed significantly increased expression of AdeB(12.3- fold), but decreased expression of AdeR (3.3- fold). However, there was no significant difference of the relative expression of AdeA, AdeC or AdeS between the two groups. In this study, we found there was a 76.7% prevalence of imipenem-resistance among the MDRAB in PICU from our hospital. Tigecycline proved to be the most active antibiotics. Even though effective and safe therapeutic options are limited against MDRAB strains to PICU patients, combination therapy is still the potential choice to fight against carbapenem resistance in MDRAB. Polymyxins, tigecycline, amikacin, imipenem, meropenem, ceftazidime, sulbactam-based regimens etc. are commonly considered. It was reported that most patients received with a combination of β-lactams and aminoglycoside, for example, imipenem-amikacin for initial empirical antibiotic therapy on MDRAB . The clinical application of tigecycline is accumulating in the treatment of MDRAB infections patients. Although many researches including this present study showed high in-vitro susceptibility rates, the role of tigecycline in treating MDRAB infections remains controversial . Some of studies challenged the use of a tigecycline-based regimen in the treatment of MDRAB infections, because of their association higher hospital mortality, lower microbial eradication rates and longer hospital stay. Drug resistance mechanisms of MDRAB are sophisticated, including the production of enzymes that act as intrinsic drug resistance, the pathogen’s amazing ability to obtain resistance determinants horizontally, accident changes of outer membrane permeability, and the role of efflux systems [12, 13]. For example, mainly due to producing various carbapenemase enzymes such as class B metallo-β -lactamases (MBLs) and class D oxacillinases (OXAs), A. baumannii developed its resistance to carbapenems. The substrate specificities of the OXA-type carbapenemases are various, but usually the enzymes hydrolyse penicillins and the narrow-spectrum cephalosporins, cefalotin and cefaloridine more efficiently, than the extended-spectrum-β -lactams. All OXA-type carbapenemases can be inhibited better by tazobactam. Although the catalytic efficiency of OXA-carbapenemases for the hydrolysis of carbapenems is lower than that of MBL (100–1000 times lower), it is important to consider them as potential hazards because their expression can be regulated by upstream insertion of IS elements such as ISAba1. BlaOXA-23, blaOXA-24 and blaOXA-58 are most common OXA-type genes detected within clinical MDRAB isolates, typically among Asia-Pacific region[15–18]. It is reported that the blaOXA-23 gene is much more prevalent, while the blaOXA-58 gene was rarely found in MDRAB isolates ; in addition, MBLs SIM, IMP, and VIM-producing A. baumannii isolates are also worth noting . In our study, all of the 86 clinical isolates possessed the chromosomally encoded enzyme gene blaOXA-51. Among these MDR isolates, such a high frequency of blaOXA-51 gene detected is likely to suggest that an intrinsic drug resistance mechanism plays an important role on the multidrug resistance. However, further quantitative assay is necessary to value the contribution of blaOXA-51 gene in the mechanism of multidrug resistance of these isolates. The widespread prevalence of blaOXA-23 gene in Acinetobacter spp. has been recently reported, that the plasmids pAZJ221 and Tn2009 were likely to play a key role on horizontally transferring blaOXA-23 gene . Hu et al. investigated 17 cases of Acinetobacter baumannii infection in a neonatal intensive care unit (NICU), and blaOXA-23 was detected in all of the isolates, suggesting that the detection of the blaOXA-23 gene might be of significant help in neonatology decision-making on managing nosocomial infection . Consistent with these findings, the present study showed that blaOXA-23 was detected most frequently (90.7%) of carbapenemase among the 86 MDRAB from PICU. Notably, we showed 18 strains among the 20 CSAB strains displayed imipenem susceptibility.To our knowledge, the OXA-23 enzyme has a high affinity to hydrolyse imipenem, however, there have been reports on occurrence of blaOXA-23 gene in imipenem-susceptible Acinetobacter baumannii . Imipenem susceptibility may be explained by the absence of the ISAba1 element upstream of the blaOXA-23 gene, since ISAba1 has promoter sequences to up-regulate blaOXA-23. Therefore, the blaOXA-23 gene may be silently transmitted in hospital settings, highlighting the undetected threat to the carbapenemase gene pool. In addition to the production of carbapenemase, efflux pumps systems also have presented important roles in the carbapenem resistance of MDRAB to antibiotics, especially the presence of AdeABC multidrug efflux pump [23–25]. Reports from other studies had indicated that the expression of AdeABC efflux pumps were obviously influenced by AdeRS [26, 27]. Either the point mutations in AdeRS or by the insertion sequence (IS) Aba-1 insertion upstream of the AdeABC operon would result in over-expression of the AdeABC efflux pump . Remarkably, single point mutations in AdeS (Thr153Met) and AdeR (Pro116Leu) are believed to be in a close relationship with AdeABC over-expression , and, as a result, these changes would lead to resistance against lots of antibiotics, including β-lactams, chloramphenicol, tetracyclines, aminoglycosides, and fluoroquinolones . In the present study, the AdeABC-AdeRS efflux systems were widely distributed among these isolates. Specifically, in the 66 CRAB strains, the distributions of AdeABC-AdeRS efflux system genes were more than 90.0%. The CRAB group had a statistically significant increased expression of AdeB gene, but decreased expression of AdeR, but there was no significant difference of the relative expression of AdeS. These results indicated the AdeABC-AdeRS efflux systems might be potential cause of carbapenem resistance, with the over-expression of AdeB gene. Moreover, the down-regulated expression of AdeR gene might contribute to this process. Though our study did not show significant different expression on AdeS between the two groups, the research by Srinivasan et al  has displayed that AdeS could confer resistance to some antibiotics. Since bacterial isolates collected in the present study were from a single clinical center, further investigation about the role of AdeS gene on carbapenem resistance is warranted. Studies about A.baumannii isolates co-harboring oxacillinase and efflux pump genes are accumulating. For example, in a hospital of Korea, it is proved that the expression both of blaOXA-23 gene and AdeABC efflux pump genes were responsible for acquiring carbapenem resistant MDRAB isolates . Hu et al. have indicated that among the imipenem resistant A. baumannii isolates, the production of carbapenemase carrying blaOXA-51/blaOXA-66 genes could contribute to the intrinsic resistance to imipenem, but the drug efflux pump systems were much more responsible for the widespread dissemination of imipenem-resistant A. baumannii . It is believed that the OXA-type carbapenemases can be fortified when increased expression of efflux pumps are present. Our study had the following limitations. First, the isolates were collected from one centre, and the sample size was small, which might result in a special tendency of the molecular characteristics of MDRAB. Second, except AdeABC, other efflux systems have not been investigated in the present study. 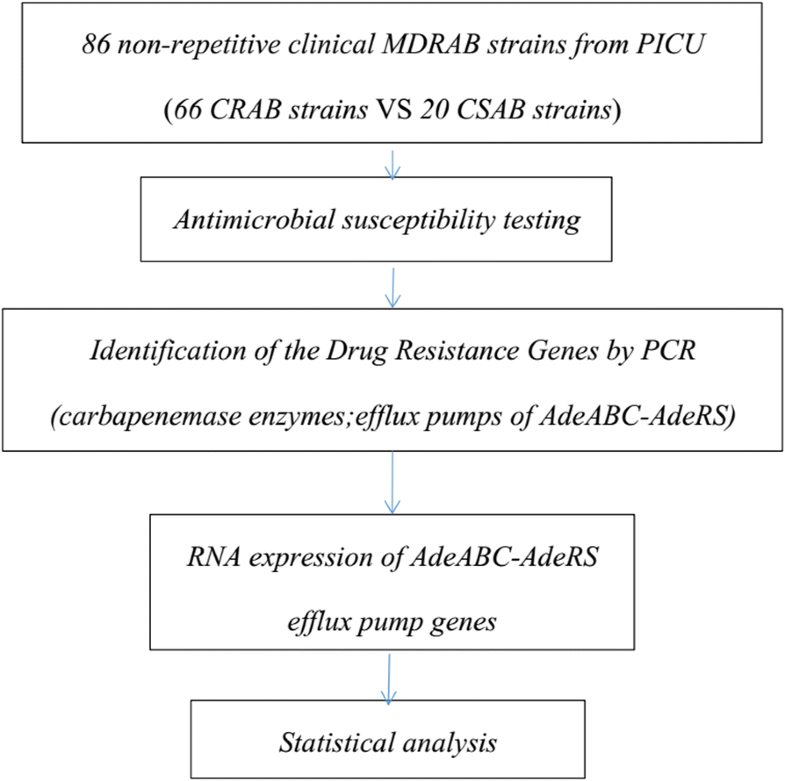 Further studies on how the AdeABC-RS system influences the decreasing carbapenem-susceptibility against MDRAB are needed. The present study showed high distributions of multiple genes, mainly the genes of blaOXA-23/blaOXA-51 carbapenemase and AdeABC efflux pump system, indicating a potential threat of MDRAB in PICU. Therefore, to develop an effective guidance to prevent hospital-acquired infections caused by MDRAB in ICUs is critical. All-around interventions such as hand hygiene, environmental cleaning, contact isolation precautions, and active surveillance are significantly important to reduce the incidence of A. baumannii infections. This study was not funded by any sponsor or financial institution. YLC was responsible for designing experiments, interpreting data and writing the manuscript. LA participated in drawing tables and helping analyse the data. PHG, HH and ZWW participated in strain collection and literature searching. XLL was responsible for operating the relevant PCR experiment, acquisition of experimental data, and interpretation of data. KL was fully responsible for designing the research and gave final approval of the version to be published. All authors read and approved the final manuscript. This report was approved by the Clinical Research and Ethics Committee of the First Affiliated Hospital of Sun Yat-sen University. Written informed consent was obtained from each participant’s legal guardian. All the bacterial isolates in this study were isolated prior to this study. Not applicable since there are no details on individuals reported within the manuscript.